March has been a busy month for trucking news, especially when it comes to the topic of turnover within the industry. There is no doubt that there has always been a high turnover rate with truck driving jobs, but with recent studies showing that the rate of turnover is now reaching a long time low, much information has begun to come out about why there is such a high rate to begin with and what several companies are doing in order to keep hired truckers from quitting. Whether or not if the decline of turnover continues, it is interesting to see how fleets across the nation are combating the problem. On March 29, 2017, the American Trucking Association released information showing that the trucking industry recently saw a huge drop in turnover rates in large fleets and an even larger drop in smaller fleets, leading to new percentages of turnover that are markedly the lowest in quite some time. Within their findings they stated that large fleets, which are considered as those with more than $30 million in yearly revenue, reduced their turnover rates by ten percent, dropping to a still high 71 percent, though this is the lowest level of trucking turnover since 2011. Smaller fleets saw a larger decline in turnover as fleets with an average revenue of less than $30 million saw a decrease of 16 percentage points, which is still a five year low – putting these fleets at a rate of 64 percent. This is also the fourth quarter that large fleets have continued to see a consecutive decline in their rates of turnover. American Trucking Association Chief Economist Bob Costello has marked this decline in turnover up to “...the overall choppiness of the freight market.” He continued by explaining that as the levels of industry are beginning to reach normal levels within the supply chain while freight volumes continue to recover, the level of turnover will in turn begin to rise, “...along with concerns about the driver shortage”, meaning that this seems to be more of a trend, rather than a long-term fix. What is even more surprising is that this is not the first time that Costello has used some form of the word “choppy” in order to describe the trucking industry. In July of last year, he was quoted saying on the topic of trucking tonnage dropping, “Looking ahead, I expect the freight environment will remain choppy.” He went on to say that the consumer side was providing a positive impact within trucking while the industrial side was reaching negative benefits. This is when June of 2016 had seen a 1.5 percent decrease in for hire trucking tonnage compared to May, when it had seen a 2.9 percent increase from the previous month. Many sources cited this difference as due to the fact that, along with Costello's findings, shipments weighed less and that consumers were dominating the industry over industrial demand. Still, the inflated percentage of turnovers within the truck driving job market should definitely be a cause for concern as the recent trend within the industry has been high levels of turnover. In 2015, a study discovered that since 2012, the turnover rate of truckers remained at least 90 percent. 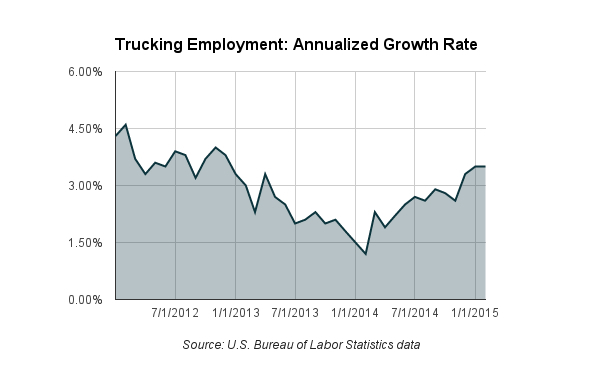 Even within those three years, trucking saw fluctuating highs and lows as in the second quarter of 2012, turnover reached an astonishing rate of 106 percent, while at the end of 2014, it had dropped to 96 percent. Though that rate of turnover is still remarkably high, it does show that the industry suffers from very wavering percentages. When it states that turnover reaches 100 percent, it does not mean that a fleet has seen a completely new set of employees come and go, but rather that five percent of drivers move between carriers and open trucking job options, rather than staying with one company. While 2015 was two years ago, it provides a close time point of comparison, as to not use outdated data to show what the market might hold. With the information that came from the United States Bureau of Labor Statistics, it showed that the hiring rate of 2013 was close to half of that of 2014. This means that while 2013 saw a growth of 24,9000 jobs, only a year later, the industry reached a growth of 46,000. Sadly, earlier data from the Bureau shows that in a three year time frame between March 2007 and March 2010, the trucking industry got rid of 218,500 jobs and within the next four years only added 207,400 jobs – a difference of 11,100 employment opportunities. By the fourth quarter of 2015, the turnover rate was back over 100 percent, reaching 102 percent. It had also reached over 100 percent in the third quarter of 2015, which was the first time the rate had done so since 2012. While this shows some of the industrial reasons for the high turnover rate, it does not show why some drivers choose to leave companies by their own decision. Many attribute the high turnover rates to the fact that many drivers are having to work harder and longer for less pay. A lot of this is due to the fact that when the “Great Recession” hit the industry, many companies are still trying to make up the difference and losses they may have suffered. What happened was that since fleets could not just store their “goods”, as it is actually a service, until the recession was over, they had to instead cut the rates they would normally charge in order to compensate for the lower rates of companies that wished to book their hauling services. States with a high percentage of truckers like Texas are looked at critically for the trends while an area like Florida is not far behind. `In a normal economic market, one expert explained, this would mean that many fleets would not be able to continue to run a profitable business by continually dropping their prices and would then result in many trucking companies having to close their doors, and more related in this case, let their employees go. Obviously, this sort of scare made several truck drivers nervous enough to seek employment elsewhere. To compensate for this lack of drivers, many companies began to hire independent contractors, rather than full-time employees, a trend that has continued today. Many of these independently contracted drivers were responsible for every aspect of their route including paying for the use of the truck, insurance, and, of course, fuel. Even with many companies offering a hiring bonus to these types of drivers, they were unable to make a gainful living for themselves as the per-mile price and fuel compensation were still unable to cover the costs they had to pay to maintain and drive the truck – leading to an increase in turnover rates for said companies. These stories are increasingly prevalent in some states like California, as well as other areas in the country where the cost of living is considered expensive. Another attribute which has seemingly lead to the heightened causes of turnover are low scores by drivers on the Federal Motor Carrier Safety Administration's Compliance, Safety, and Accountability tests. Vigillio, a company which analyzes safety data within the trucking industry found earlier this month that out of the 2,000 customers they analyzed, carriers with increased turnover rates also have 181 percent more hours of service violations as compared to carriers with little turnover. This pattern continued for controlled substance violations with 182 percent, 211 percent more violations in the categories of unsafe driving and vehicle maintenance, 213 percent more in driver fitness, 224 percent more crash indicators, and an incredible 640 percent more hazmat violations. Obviously, whether it is the lowest it has been in five years, there is still a huge amount of turnover within the trucking industry. 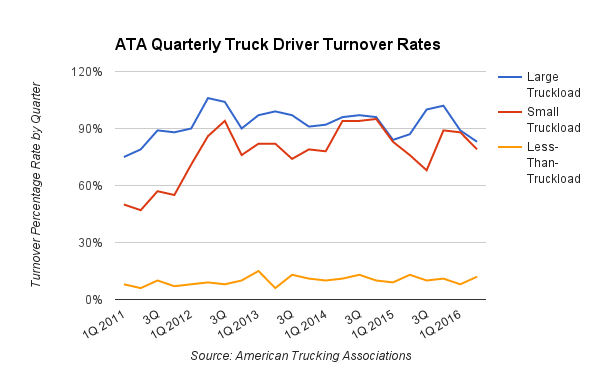 Even more so, the ATA does not seem to think that this decline of turnover is even a semi-permanent trend as they expect the turnover rate and driver shortage to return “back to normal” again soon. In fact, the ATA said in 2015 within their “Truck Driver Analysis 2015” report that there was then a shortage of at least 48,000 truck drivers and that by 2024, the shortage could reach as many as 175,000. Many companies are taking necessary and precautionary steps to try to combat the issue of turnover on a small, more personal scale – an effort that they also help with increase driver morale. One such company is Southern Refrigerated Transport in Tennessee, which is a subsidiary of Covenant Transport. They have utilized a software company called WorkHound that allows better, and much needed, communication between drivers and carriers. Another huge benefit of this software that helps reduce turnover is the fact that drivers are also allowed to provide feedback on how they think the company can improve as well as complete surveys to make sure their voices are heard. This technology has worked so well for the company that last year, the first year they began to use it, they were able to decrease turnover by 16 percent, which not only helped to boost morale, but also to save the company $580,000 in hiring and training costs. 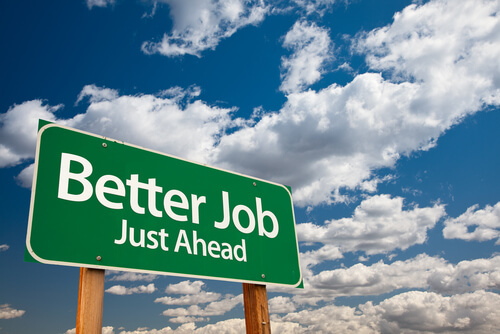 It seems that the simple task of ensuring that drivers feel appreciated and acknowledged for their work can be a large and influential force in ensuring that the positive trend in driver turnover stays as is. Many companies can encourage their drivers to have an outlet to for some catharsis by way of blogging or video blogs - much like the way popular trucking vlogger Allie Knight chronicles her life on the road. In one sense, it seems like great news that finally, the trucking industry is beginning to see a steady drop in the rates of turnover, which would seemingly mean a more steady line of work for truckers, but it is more than just a little unnerving that what is meant to be the “...largest national trade association for the trucking industry...” does not feel that it is something that will last. Furthermore, there is no information on just how much or little longer the decrease, or even the possibility of stability, of turnover will keep up. Of course, turnover is a problem for individuals who hold a trucking job, but this proves that, now more than ever, it is important for truckers and fleets to work together to continue to decrease turnover.